Experience life at the time of the Sky Disc! In the app "Der Bronzene Himmel" you can explore the history of the Nebra Sky Disc and get to know about life in the Bronze Age. The Bronze Age children Mimo and Leva will take you to their village between the Saale and Unstrut rivers. Be there when the Sky Disc is laid down, understand the five stages in the life of the disc , and become ruler of the Sky Disc yourself in a logic/strategy game! To install the app, you need an Android or iOS device. Tap on the appropriate store to buy the app for €2.99 or let your parents buy it. 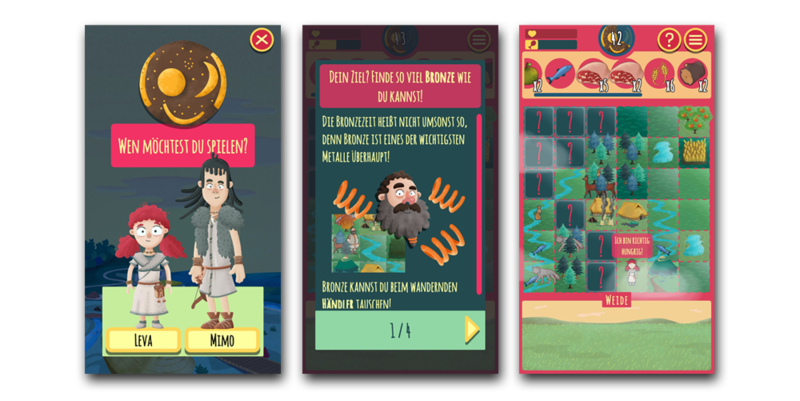 In the game you can build your own Bronze Age village and lead it to great wealth. But beware - life in the Bronze Age was also dangerous! Can you fend off wolves and forest fires, reap a good harvest and collect beautiful bronze jewellery? Play as a farmer, fisherman, hunter or woodcutter and become ruler of the Sky Disc! "Der Bronzene Himmel" is not only available digitally, but also as a magazine. The magazine also includes an android app voucher - but that‘s not all! In addition to the android app voucher, you can find further interesting information about the Sky Disc and its creation in the "Der Bronzene Himmel" magazine. An exciting comic explains the moon and solar year to you. 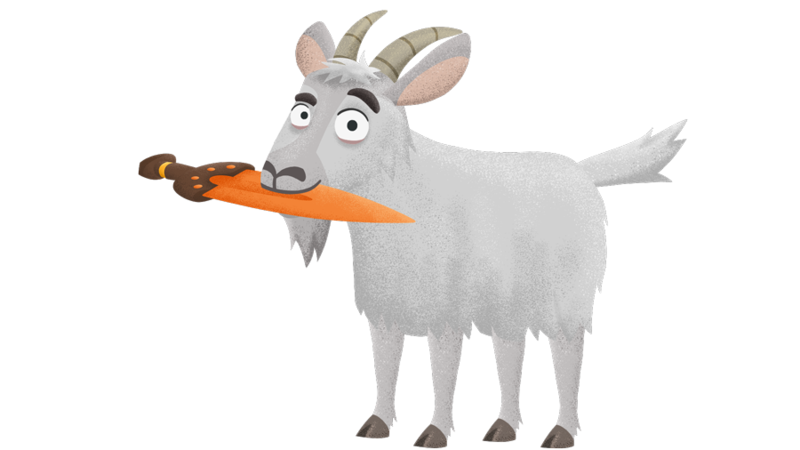 For those who like creating something there is also a paper model of Mimo and Leva's home to make – a real Bronze Age longhouse - and on top of that you get a key ring with the funny goat you'll get to know in the app. 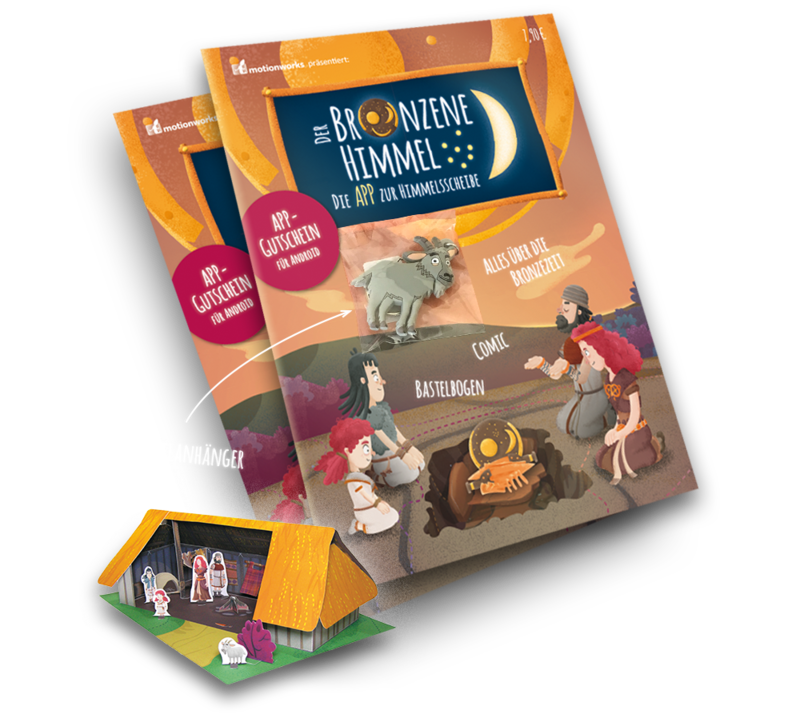 The magazine is available at the museum shop in the Nebra Ark visitor centre as well as at the museum shop in the State Museum of Prehistory in Halle (Saale) (Landesmuseum für Vorgeschichte in Halle/Saale). Images of the Sky Disc courtesy of the Landesmuseum für Vorgeschichte Halle (Saale). Produced by MotionWorks in collaboration with Codemacher, Rat King Entertainment and the Sisters of Design. The project was supported by the state of Saxony-Anhalt and the Mitteldeutsche Medienförderung.